Foundations for Farming is an initiative aimed at bringing transformation to individuals, communities, and nations through faithful and productive use of land. Their desire is that through the life lesson of farming they will help the vast masses of Africa and the developing world, who are dependant on the land, to faithfully use what they have been given to turn a profit and come out of poverty. 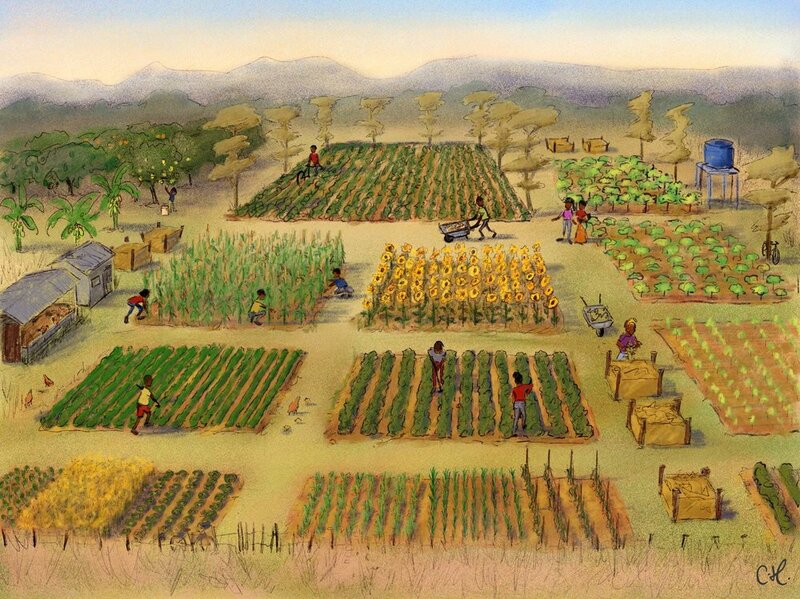 These drawings were created to fundraise for their next project: a two year residential farming program that will enable those who live further than biking distance to learn the foundations for farming and begin to grow produce for themselves. The community scene above describes the vision for this project. One central community house lived in by the family who will oversee the program, surrounded on each side by three houses for women and three houses for men. It was important that the drawing describe the different aspects of community life: that everyone will share in the day to day chores of living like cooking, cleaning, gardening and gathering fire wood, and that there will be moments each day for group study. The scene below describes the different stages and types of farming the residents will learn over the two years.